“In the Psalter you learn about yourself. 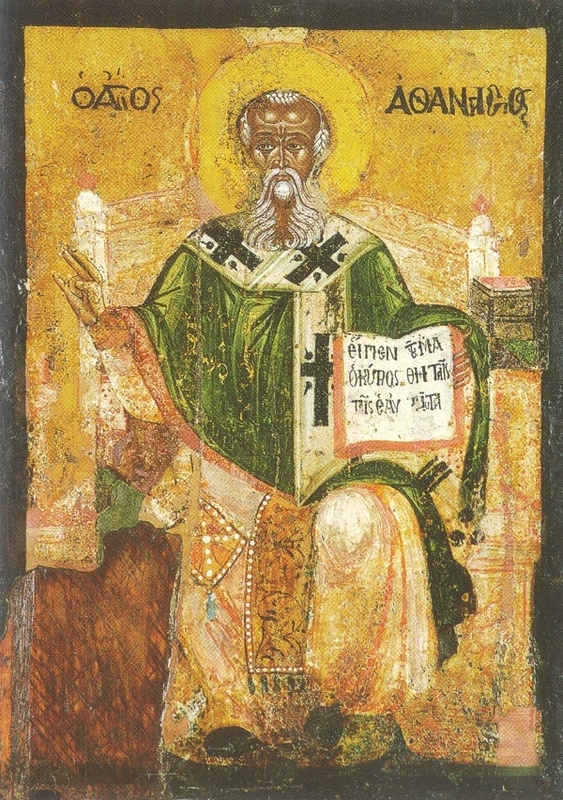 Today the Church honours St Athanasius, one of the most influential of our early theologians. He is best-known for his championing of the real divinity of Christ in opposition to Arius who taught that Christ was a created being. Athanasius stood against Arius, and at great personal cost defended the Faith which he explains in On the Incarnation. He was severely persecuted. He attended the Council of Nicea (325 A.D.), and died as Patriarch of Alexandria in A.D. 373. I once talked with a certain studious old man, who had bestowed much labour on the Psalter, and discoursed to me about it with great persuasiveness and charm, expressing himself clearly too, and holding a copy of it in his hand the while he spoke. So I am going to write down for you the things he said. Son, all the books of Scripture, both Old Testament and New, are inspired by God and useful for instruction, as the apostle says; but to those who really study it the Psalter yields especial treasure. Within it are represented and portrayed in all their great variety the movements of the human soul. It is like a picture, in which you see yourself portrayed and, seeing, may understand and consequently form yourself upon the pattern given. In the Psalter you learn about yourself. You find depicted in it all the movements of your soul, all its changes, its ups and downs, its failures and recoveries. Moreover, whatever your particular need or trouble, from this same book you can select a form of words to fit it, so that you do not merely hear and then pass on, but learn the way to remedy your ill. Prohibitions of evildoing are plentiful in Scripture, but only the Psalter tells you how to obey these orders and refrain from sin. But the marvel with the Psalter is that . . . the reader takes all its words upon his lips as though they were his own, written for his special benefit . . . But the marvel with the Psalter is that, barring those prophecies about the Saviour and some about the Gentiles, the reader takes all its words upon his lips as though they were his own, written for his special benefit, and takes them and recites them, not as though someone else were speaking or another person’s feelings being described, but as himself speaking of himself, offering the words to God as his own heart’s utterance, just as though he himself had made them up. It is possible for us, therefore to find in the Psalter not only the reflection of our own soul’s state, together with precept and example for all possible conditions, but also a fit form of words wherewith to please the Lord on each of life’s occasions, words both of repentance and of thankfulness, so that we fall not into sin; for it is not for our actions only that we must give account before the Judge, but also for our every idle word. So, then, my son, let whoever reads this book of Psalms take the things in it quite simply as God-inspired. When you would give thanks to God at your affliction’s end, sing Psalm 4, Psalm 75 and Psalm 116. When you see the wicked wanting to ensnare you and you wish your prayer to reach God’s ears then wake up early and sing Psalm 5. For victory over the enemy and the saving of created things, take not glory to yourself but, knowing that it is the Son of God who has thus brought things to a happy issue, say to Him Psalm 9; and when you see the boundless pride of man, and evil passing great, so that among men (so it seems) no holy thing remains, take refuge with the Lord and say Psalm 12. And if this state of things be long drawn out, be not faint-hearted, as though God had forgotten you, but call upon Him with Psalm 27. If you want to know how Moses prayed, you have the 90th Psalm. When you have been delivered from these enemies and oppressors, then sing Psalm 18; and when you marvel at the order of creation and God’s good providence therein and at the holy precepts of the law, Psalm 19 and Psalm 24 will voice your prayer; while Psalm 20 will give you words to comfort and to pray with others in distress. When you yourself are fed and guided by the Lord and, seeing it, rejoice, the 23rd Psalm awaits you. Do enemies surround you? Then lift up your heart to God and say Psalm 25, and you will surely see the sinners put to rout. And when you want the right way of approach to God in thankfulness, with spiritual understanding sing Psalm 29. So, then, my son, let whoever reads this book of Psalms take the things in it quite simply as God-inspired. In every case the words you want are written down for you, and you can say them as your own.